Fan Forum > TV Shows - Present > The 100 > Commander Lexa [Alycia Debnam Carey] #1: "The massacre must be answered. Blood must have blood." 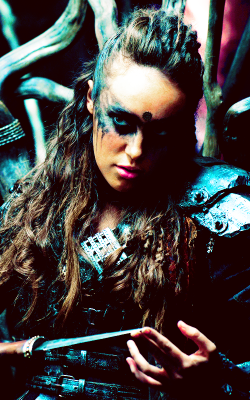 Commander Lexa [Alycia Debnam Carey] #1: "The massacre must be answered. Blood must have blood." 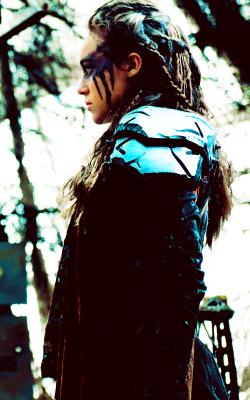 I'm really exited to learn more about Lexa. They have a lot of back story to fill in for us. How did she gain her position as Commander? What are the twelve nations, and what was the Ice Queen's problem?? Is she going to change how the Grounders act toward the Sky People through this alliance? I hope the writers take the time to give her a meaningful back story. I really wanted to have some Anya backstory, but look at how well that turned out. I don't want them to do the same thing with Lexa. Did she say something about twelve nations? I think I missed that entirely. ^I need to go back and re-watch but I think she said something about the number of nations and how despite the Ice Nation having killed her girlfriend, Lexa still brought them into the alliance. Did I imagine that? I was a little distracted last Wednesday night. Thanks for starting the thread, Josie! Will you add me, please? That story she told Clarke. I didn't know how to take it. Some are saying the girl she talked about was her girlfriend, others are saying that maybe they were more like sisters. I hope this is brought up again. There are too many open ended character stories. I'm pretty sure Lexa was talking about her girlfriend. She was comparing the loss she went through with Clarke's loss of Finn. I don't think the show really needs to delve too much deeper. Since then Lexa chose never to love or care about someone again and she more or less advises Clarke to do the same. I can see this show focussing too much on relationships, which is kind of one reason I was happy they killed Finn off as it eliminates that Bellemy/Clarke/Finn triangle they had going. I like Lexa, hopefully they keep her around and don't kill her off as quickly as Anya. If it is that type of relationship and Lexa becomes more of a regular in the series, I'm sure her past will be brought up again especially if they give her a romantic relationship. I could see her developing feeling for Clarke, but I'm hoping they don't go there. I really do need to know more about how she was chosen as the Commander. She said it was reincarnation (right? Or something like that?) but do they have some sort of shaman that can "see" this. If Lexa dies, is it a baby that is chosen and her second (who I guess is Indra now) becomes the leader until the baby comes of age? Or do they believe that the soul of the dead Commander goes into the person that they deem most worthy. Here's hoping we get some of those answers. It could be something to explore. I'm interested in learning more about. I thought the reincarnation is just the next potential chosen. Don't they all have someone in training, someone to take their place if they die? I don't want her to die. I actually really like the character. I don't really want her to die either but it really did feel like the how-a-new-Commander-is-chosen conversation was foreshadowing that a new Commander will be chosen by the end of the season. I like her too. She's another great strong female character. Plus, besides Lincoln and Anya she's the only one that's truly been willing to work with Arkers and if she dies then the alliance dies and what they're trying to build with the Grounders will be lost. If she dies what if Clarke gets chosen. I would be sad though is she did die.